When pesky fleas burrow deep into your pregnant dog's fur and take up long-term residence, you might have to think twice about relying on your previous go-to for flea control. In addition to your dog's well-being, you'll also have to think about the potential health risks for her unborn pups. Here are a few options to consider when deciding the appropriate flea treatment for pregnant dogs. Generally, topical flea medications are acceptable treatments for pregnant dogs. Prescribed by vets, Revolution is a topical flea and heartworm medication that's considered a safe flea control for pregnant dogs. The medicine kicks in a couple of hours after it's been applied to the shoulder blades of your dog. According to a 2013 study by the journal Parasites & Vectors, Revolution was more than 90 percent effective against fleas 30 days after treatment. Over-the-counter flea medications, such as Advantage II and Frontline Plus, are also generally considered safe for pregnant dogs. There isn't much consensus when it comes to the safety of administering oral flea medications to pregnant dogs. Some medications, such as Bravecto, is approved for use in pregnant dogs, and the dosage lasts 12 weeks. Other prescription pills, like NexGard, Simparica, and Credelio, have not been evaluated for use in pregnant, breeding, or lactating dogs. In September 2018, the Food and Drug Administration issued a new Animal Drug Safety Communication based on data received as part of its routine audit, which found some animals experiencing muscle tremors, ataxia (losing control of bodily movements), and seizures. While these reactions are not related to a dog's pregnancy, owners should be aware of the possible additional side effects of these medications. 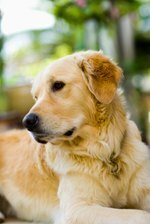 It is advisable to discuss your options on the solutions for dog fleas and pregnancy with a trusted vet. If your dog has a severe allergic reaction to flea bites, you might decide that the pros of oral flea medications outweigh the cons. If you do end up administering oral flea-control pills to your pregnant dog, remember to read the medication directions thoroughly first. For example, Bravecto should be given with food to maximize the bioavailability of the active ingredient. Typically, if your dog reacts badly to the flea medication, you'll know within a few hours. So, pay close attention to your dog and notice if there's been a change in behavior or temperament. Also, it might be a good idea to administer the drug earlier in the day (as opposed to late-night, after-business hours), so your vet could be available to assist in case anything happens. For your peace of mind, you might want to opt for nontoxic flea treatments for pregnant dogs. Many of the natural remedy ingredients can be found in your kitchen. First, draw your dog a bath of warm water and add about 1 cup of Dawn dish detergent. Soak her in the soapy water for about 5 minutes. Then, use a flea comb and meticulously hunt out the blood-sucking insects. After rinsing the soap off your dog and towel-drying her, spray your pregnant dog with a mixture of apple cider vinegar and water. Finally, add a few drops of rosemary oil to your dog's collar. Other popular home remedies include adding apple cider vinegar or extra-virgin coconut oil to your dog's food. After you get rid of the fleas on your pregnant dog, you'll have to make sure her surroundings — furniture, dog bedding, carpet — are also insect-free. Wash all the beddings in hot water. And sprinkle boric acid powder all over your carpet and fabric furniture, let it sit for a few hours, then vacuum it all up. Rosemary, lavender, and mint are natural flea repellents, so consider adding those plants to your garden or around the house.